Hello Loverlies! I entered a giveaway a few months ago at Rockstar Book Tour and actually won! 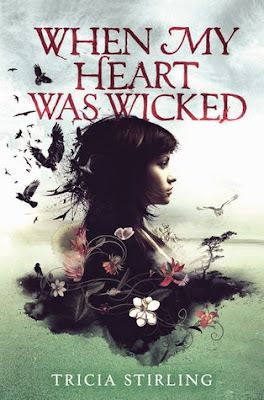 I won When My Heart Was Wicked by Tricia Stirling. It is not a very thick book and in the back it states this is her first Novel she has written. How exciting! Also I love how Beautiful the artwork on the book cover is! I found myself staring at it and looking at all the details many times. (I like sharing the synopsis from Goodreads a lot of times, because I am worried I will give away too much) I enjoyed reading this book and it was an easy read. Also I found enjoyment in learning about each character, and found myself rooting for certain ones. I will say Stirling kept me guessing throughout the whole book. It was very suspensful trying to figure out which character is evil/good. Maybe I need to read more Mystery/suspensful books? I always love books/movies where I cannot guess who is the evil character, or when I cannot figure out how it is exactly going to end. I love stories that blow my mind and make me think "What just happened?!". I recommend giving this book a read. I cannot wait to see what other books Stirling comes out with. I know I will keep an eye out! Have a Blessed Day!